“Club-Opuntia”, referring to the typical club-shaped stems of the species in this genus. A genus of dwarf, bushy and low-growing plants, densely branched, with shortly cylindrical to clavate small segments, tuberculate and not ribbed. Spines having a sheath only at the apex, one is usually sturdier, angulate and flattened, sometimes with a bulbous base. Glochids are present. Flowers diurnal, self-sterile, funnel-shaped, mostly light yellow, more rarely white (C. marenae) or red (C. guccinii), pollinated by insects, especially diptera and hymenoptera. Fruits not very spiny, fleshy at the beginning, then drying. Seeds large, flattened to suborbicular or more or less oblong, straw-coloured. 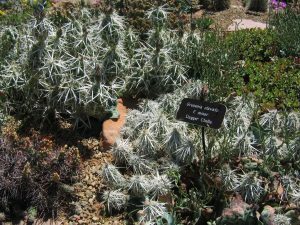 The genus Corynopuntia grows in northern Mexico and southern United States, in the deserts of Mojave and Chihuahua, practically from sea level up to 2500 m in altitude, always in very dry areas, the matorral, consisting of xerophytic plants, among bushes, in cracks of rocky outcrops at foothills, on open, gravelly or clayish-sandy alluvial plains, plateaus, valleys, sometimes on oxidized, muddy, sandy or rocky limestone sedimentary soils, old stabilized dunes, together with cacti and other succulents. 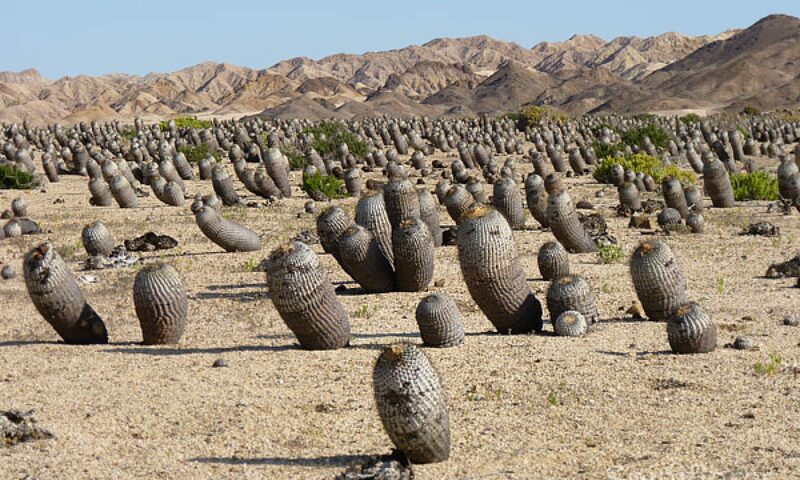 Plants are often used by several rodents and lizards as a protection against predators. Mexico (Baja California, Chihuahua, Coahuila, Durango, Nuevo-Leon, San Luis Potosi, Sonora, Zacatecas), USA (Arizona, California, Nevada, New Mexico, Texas). Good to see this genus reestablished. I am also trying to get seeds of this plant for my work 3rd and 4th volumes of Taxonomly of the Cactaceae. If you get some, please contact me!